The material used in the manufacture of a pipe and its' shape have a profound influence upon the aesthetic of a smoke. The majority of pipes sold today are manufactured from Briar, a particularly good wood for pipes as it has a natural resistance to fire and absorbs moisture well. Briar is obtained from the root burl of a tree native to the Mediterranean region where the soils are rocky and sandy. Other materials used in pipe making include meerschaum, a mineral found in shallow deposits in central Turkey that is white in color and surprisingly low weight; clay; calabash, a labor intensive and expensive material to use but, made famous by Sherlock Holmes; corncob; synthetic materials, including Bakelite, pyrolytic graphite, and nylon; and in rare cases, metal. Denecool pipefilters can be used in any pipe. Placed in the bottom of the bowl, our pipefilters will not fail to enhance your enjoyment. The Denicotea Blitz System, an activated charcoal pipefilter, which reduces tar and nicotine for a dry and cool smoke. Denicool pipefilter crystals, which are placed in the bottom of the pipe bowl and are emptied out with the tobacco at the end of the smoke. Condensate saturates the pipefilter crystals, turning them a dark brown color, ensuring a cool, mild and dry smoke. Denicool pipefilters reduce tar and nicotine and absorb condensate and humidity, keeping the full flavor of the tobacco. Our Denicotea Absorba charcoal pipefilter crystals reduce tar and nicotine, ensuring a cool and dry smoke. 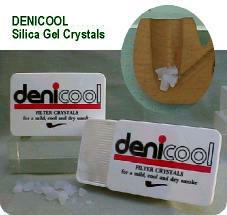 Denicotea cigarette filters can also be used with any Denicotea system pipes. Our Denicotea pipefilters are used as bowl pipefilter, allowing the smoker to smoke all the tobacco in the bowl with no soggy remnants in the bottom of the bowl, reducing wastage. Filters that are inserted into the pipe's "plumbing" cannot absorb moisture and are only effective at slowing down the flow and cooling the smoke. They are primarily used by pipe smokers to prevent small pieces of tobacco from being drawn down from the bowl to the mouthpiece, restricting the airflow, making it difficult to draw. Our pipefilters will prevent small pieces of tobacco from entering the pipe's "plumbing," In addition to preventing these small pieces from being drawn into the pipe, our pipefilters also absorb tar, nicotine and condensate, ensuring a dry and cool smoke right down to the bottom of the bowl.